☆☆☆☆ “Russian Doll is a beautiful puzzle piece, a circular, multiplane, existential mystery-comedy set in the villages of Lower Manhattan. Peopled with memorable characters large and small, it’s a show that having watched once — not hard to do straight through and hard not to do straight through — you may want to watch again, to admire its machinery and joinery and find the clues you might have missed, but also because it feels just as good the second time around.” — Los Angeles Times. ☆☆☆☆ “Part of what makes the series so special is how it’s meticulously constructed, shedding layer after surprising layer until the bittersweet end. (Hence: Russian Doll.) Digging too deep into what makes this show great would mean betraying too many of its secrets, and the joy of discovering them is just too much fun to ruin here.” — Variety. ☆☆☆☆ “2019’s best new show to date, a cerebral yet propulsive eight-episode dramedy.” — Time. ☆☆☆☆ “As a show with a particular and confrontational attitude, Russian Doll won’t stick for all viewers. For those with early doubts, my own nesting doll of reactions went from ‘This is reasonably clever’ to ‘This is actually good’ to ‘Huh, that was pretty impressive.’ Go in knowing as little as possible and stick it out for the ride.” — The Hollywood Reporter. 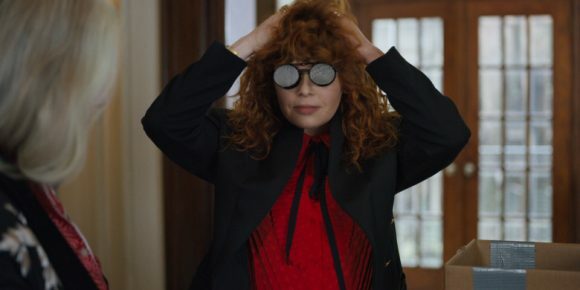 ☆☆☆☆ “Russian Doll joins a boomlet of eschatological TV comedies (The Good Place, Forever) that use death and rebirth to attempt screwball inquiries into how to live … While this might seem to tell you everything about Russian Doll — another variation on Groundhog Day — it’s the way the series twists and complicates the premise that makes it much more than a copycat.” — New York Times.